In the middle of February, 2008. 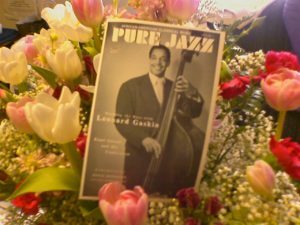 I had a flash about the legendary jazz bassist Leonard Gaskin and I called his cell phone. It didn't work, so I called the nursing home in New York where Leonard stays. A nurse told me his wife had passed away a month ago, and that since then Leonard stays in his bed most of the day. After a few days, I was able to reach him but he sounded as if he were sad and in a difficult situation. I decided to visit him as soon as I could. Because, I didn't want to have any regrets! 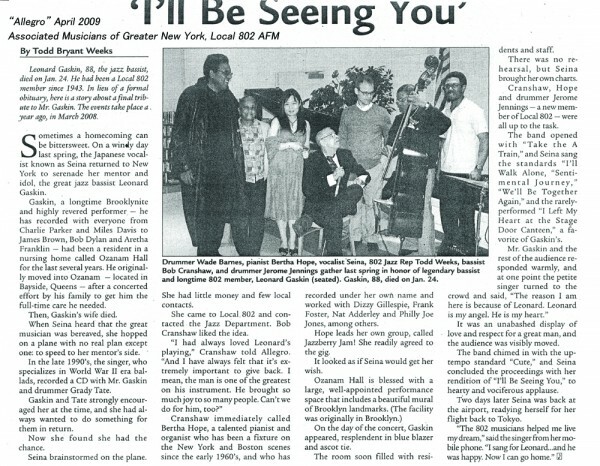 A night before I left for NY, I thought I'll make a flyer and bring it to AFM, Local 802, the musician's union and then ask the union to have some help in giving a performance for Leonard Gaskin. This was what flashed through my mind. I packed some clothes, the flyer, some musical chart and my microphone! Late on the night of March 16, I arrived in New York City. The next day I visited Leonard. He did his best to be looking fine and nice, but I could see he was hurting inside. How do you know Mr. Gaskin? "He is a great jazz bassist and I recorded with him!" "Do you have a copy of a the CD ?, I'd like to listen to it." "Well, I think Leonard has it, I will ask him if I can borrow it." Then he played it in the hall on the 6th floor of the nursing home. When they played my CD, some of the residents and the staff talked to me. Then I met a lady who works in the Activities Dept. and she introduced me to her manager, Ms. Marilyn Gindi. I asked Ms. Gindi to schedule a performance, if possible. But I didn't have any musicians yet and I wasn't sure if I could make the whole thing happen. She kindly told me that she would also try to find some musicians and any date would be fine during the following week. The next morning, I ran to Local 802, the musician's union , without any appointment. "I like to talk somebody who knows a lot about jazz ." "It will be Todd Bryant Weeks, you can go up by the elevator." "Are you Todd? I'm a friend of Leonard Gaskin's. Do you know Mr. Leonard Gaskin?" "He is in a nursing home in Queens and his wife passed away about a month ago. He is in very sad. So I come from Japan to visit him for 2 weeks." Then I told him about the plan. and told me that Bob Cranshaw was willing to play with me. And also it seemed to me like a miracle! him again in such a situation. Todd called the jazz pianist Bertha Hope, who is friend of Cranshaw's and she agreed to play with me as well. No one would get any money, The musicians and the union donated their services. They were just doing it for love, for the love of Leonard and music. On March 27th, the performance was scheduled to begin at 2PM. We had no rehearsal and I had had no performances for 8 years. Local 802 Union Rep Todd Bryant Weeks acted as MC for the event. He was the right man for the job, as he had played Bix Beiderbecke in a movie in the 1990s and was good on the microphone. He had also just written a book about Hot Lips Page called Luck's In My Corner: The Life and Music of Hot Lips Page, and he really knew about the music, and about Leonard's career. Even though I made some mistakes during the concert, the band supported me warmly. They were all top notch musicians, real professionals. I could hear the residents, many of whom were in wheelchairs, singing along. And Leonard was smiling and laughing throughout the event. I was really, really happy and everybody there was happy and filled with warm feelings. "When I was a young... Leonard helped me. He is one of my mentors. Seina, I always wanted to do something for Leonard and I am very glad I could have the chance." Bob Cranshaw said. When I visited Leonard after the show, he was sitting on a chair in the hall and smiling and joking with the staff and other residents. A few days later, a nurse told me that Leonard had experienced a big change after the show. Now he often came out from his room and was eating well. When I left, I said to him, "Leonard, promise me. Enjoy your life." "OK, Ill enjoy my life." Love, gratitude and music, I found these are strong factors of healing for the mind and body. On March 27, the day of the performance, it was my birthday. It was the most beautiful and wonderful birthday of my life. I now appreciate that in life it is always possible to have such a wonderful encounter. I was able to experience all of this by having the courage to take a leap of faith; even if I had to go to the other side of the Earth to make it happen. I'll be seeing you again, Mr. Leonard Gaskin!